Today I had great hopes for a nice winter wonderland photograph. The snow from earlier covered the ground so I took the dog for a walk with the camera slung around my neck. 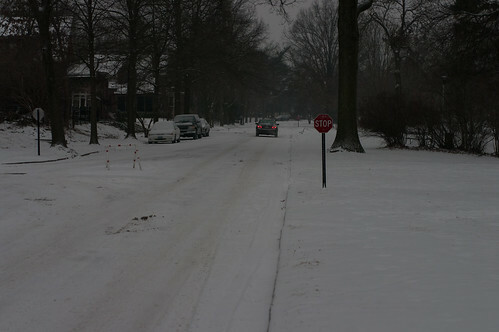 It was not too long before I saw a red stop sign standing out amongst the white and gray tones of everything else. I remember that cameras can be fooled by the bright white of a snow covered ground. To compensate you increase the exposure compensation a half stop or more. To me this is a little confusing, so I will do my best to explain at the bottom of the post. But now, back to the story. 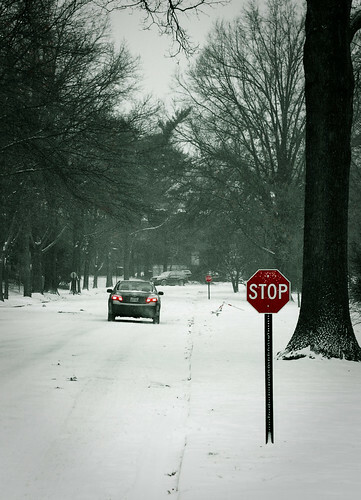 I saw the stop sign and in my mind had a great photograph all figured out. Put the sign in the bottom right corner and it will be great. I just have to remember to dial in some exposure compensation. In reality it did not work out that way. I remembered the compensation, but did not like any of the photographs. I screwed up the composition. I don't want to skip a day or throw out the photographs, sot how do I turn nothing into something? That is exactly the answer! I will try to turn the crappy photo into a decent one. The end result is above, here is what I started with. That photo and about 5 minutes in Adobe Lightroom gave me the photo of the day. Granted it is not an amazing photo by any stretch of the imagination, but it is a great improvement over the original. At least it is in my opinion. What do you think? Let me know in the comments. Now for my explanation on exposure compensation for snow. A digital camera has to make a lot of decisions about the scene and lighting to figure out how to set the variables, typically aperture and shutter speed. To do this, it needs a reference point. For the camera that is 18% gray. I guess if we had to look at the world and find an average value, someone figured it out to be 18% gray. When the world is covered with snow, it is much brighter than 18% gray, but that does not stop the camera from thinking it is. Therefore, the camera closes the aperture and/or speeds up the shutter so it lets in the correct amount of light for a scene that is only 18% gray. That is why so many snow snapshots look gray and dingy. The camera made the snow 18% gray. Of course the snow is much closer to white so compensating by telling the camera to allow more light brings the snow up to white again. At least that is how I understand it. Correct me if I am wrong.